I created this card for McKenzie's Birthday. Madison and her turned 6 on May 1st. McKenzie loves ladybugs and I have been wanting to use this mason jar. This is my first time that I have welded in the Silhouette Studio to make a card and I have to say it was quit simple. Hope you will join in both fun challenges!! Too cute. Love the ladybugs. I just absolutely love your card!!! 1st time welding?...This is AWESOME!! !TOTALLY Cute! Love it! This card is awesome!! 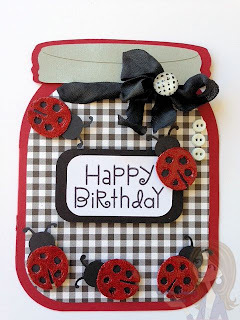 Love the shape, the colors and the adorable lady bugs!!! This is so cute! I love the lady bugs! Happy Birthday to your daughters! This is stunning! i love the black checkered paper.